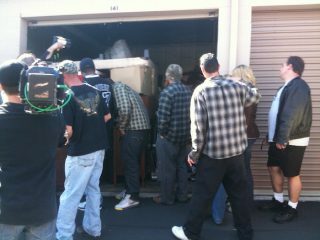 Storage auctions arise when a facility is left with items from a former customer that they need to dispose of. There can be many reasons why a storage company might find itself in this situation, but usually it is due to rent payments on self-storage not being maintained by the customer and the appropriate terms of the storage contract having to be invoked. Rather than put individual items up for sale, which would be dreadfully laborious, the whole storage unit is put up for public auction as a sale lot, and there are some out there who make a tidy income from selling the items that they have purchased as part of the lot. It may seem strange that people might put their belongings away into storage only to leave them to be forgotten, but happen it does. One scenario might be that someone puts into self storage items that they ultimately no longer need and as such let their payments to the self storage company lapse over time, since these may not have been such important items for them, essentially releasing themselves of the responsibility of ownership. Storage contracts will always state what will happen when payments have ceased, and if you don’t pay up or pick up your belongings the storage company will more than happily dispose of them for you, and furthermore they may well profit abundantly from this. In sadder cases units may be given up because the person leasing can no longer afford it – likewise if they don’t pick up the items or renegotiate their storage term then any remaining items will be sold off to auction. Storage companies however will go to great efforts to contact people who haven’t paid, just in case they have simply forgotten, or work out an alternative payment plan in order to sustain the client relationship if times are hard. They aren’t in this business to be completely heartless after all. But if no payment is forthcoming and no agreement can be arrived at, auctioning the contents of the storage unit will have to be the last resort. The self storage facility should offer a period of grace in which to make the relevant contacts to the affected customer, and only once they are fully sure that it is legally acceptable to do so, will they arrange to transfer the rights of ownership of the property to the winner of any future auction. In recent times storage auctions have picked up in popularity, and now many are seeing this as a way of making money from thrift and potentially expensive items that can be found inside abandoned units. Recent prime time television programs have focused on the phenomenon and competitiveness of storage auctions. Rules and conditions between auctions may vary, but most commonly it starts with an advertisement in local press from the storage company announcing auctions. Next the storage company would allow prospective buyers the opportunity to have a quick examination of the unit so that they have a rough idea of the worth of the contents before placing a bid. However these days as you might expect, news of storage auctions are now no longer locally restricted and you should have no problems finding advice, news and upcoming auction dates on the internet. Following the bidding process, payment to the self storage company by the winning bidder is expected as soon as possible and the contents likewise to be picked up at the earliest possible convenience. Or, with a hint of irony, put into storage to be leisurely sold of piece by piece. It is certainly a lucrative market, and many people go to these auctions in the hope to find bargains or potential valuables lurking in the shadows of the square metal units from which good money can be made. Quite often, at someone else’s expense, they do.